18 ST | January 2019 www.sea-technology.com shore or in remote coastal areas. For example, metocean buoys or AUVs far offshore are limited in their operations by the power that can be supplied by onboard batteries, impacting collection and transmission of critical data. Power also remains a constraint in other sectors within the blue economy due to limitations of traditional pow- er-generation technologies. Internal combustion engines depend on a reliable fuel source for sustained operation, which is not cost-effective or practical far offshore. Solar is limited to the ocean surface, typically out of direct con- tact with seawater and subject to rapid decreases in effi- ciency due to fouling from salt spray, biological growth and bird droppings. Small-scale wind systems tend to be lower in power density, prefer a relatively stable platform (not ideal for applications like buoys), and, like solar, they need to be above the ocean's surface. Marine energy can potentially overcome many of these limitations. Seawater is 784 times denser than air, which theoretically reduces the physical footprint required to extract a given amount of power relative to other resources. Marine energy converters are marinized from their in- ception and explicitly designed to extract energy from dynamic waves, tides or ocean currents. Many marine energy systems can also generate power beneath the surface, improving stealth characteristics and storm sur- vivability. Finally, marine energy is both predictable and reliable, reducing the reliance on large energy storage systems or backup generators that typically accompany other systems. Readily available power at sea could be a key enabler for many sectors and markets within the blue economy, unlocking untapped growth potential. Conclusion There is a transformation within traditional and emerg- ing maritime industries harnessing advanced technology to provide environmental and economic benefits, which requires innovation in energy systems. Ocean observa- tion systems, seawater desalination, underwater vehicle recharging stations, and even offshore aquaculture are all examples of marine applications and industries that have growing needs for power at sea. Marine renewable ener- gy could become an important part of the blue economy by enabling a host of new opportunities: generating jobs, supporting new markets and revolutionizing existing power-limited industries. WPTO will continue its efforts to drive new marine energy technology innovations to provide power for the blue economy and the nation. ST The Blue Economy The blue economy is diverse and continues to evolve (https://bit.ly/2teIKgn). According to a recently drafted report for the European Commission, just the living re- sources sector of the blue economy (fisheries, aquacul- ture, etc.) has grown by 22 percent from 2009 to 2016 (https://bit.ly/2tKMKnL). In a report published by the Or- ganization for Economic Cooperation and Development (OECD) in 2016, it's estimated that the global value of ocean-related industries was $1.5 trillion in 2010 and will exceed $3.0 trillion by 2030 (https://bit.ly/2Q5nx4P). Powering the Blue Economy The various markets and sectors within the blue econ- omy may provide marine energy technology developers with crucial first customers, ideally leading to increased revenue generation, investor confidence and, most im- portantly, more operational experience for devices. In theory, this is a reinforcing feedback loop: Once a de- veloper gains customers and revenue, they can more effectively self-fund research and development, create new technological innovations, find new markets and customers, and generate new revenue, thus continuing the cycle. 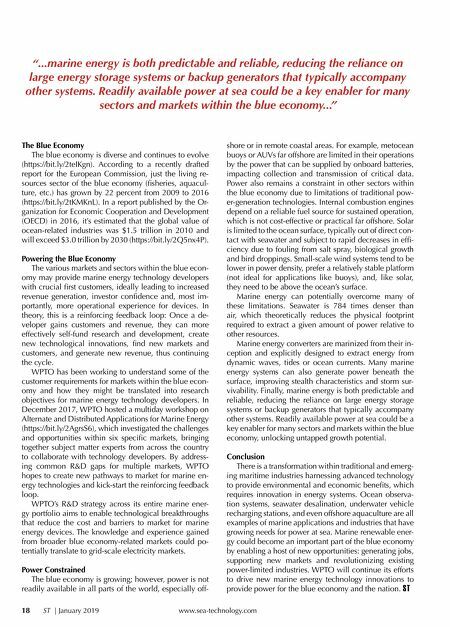 WPTO has been working to understand some of the customer requirements for markets within the blue econ- omy and how they might be translated into research objectives for marine energy technology developers. In December 2017, WPTO hosted a multiday workshop on Alternate and Distributed Applications for Marine Energy (https://bit.ly/2AgrsS6), which investigated the challenges and opportunities within six specific markets, bringing together subject matter experts from across the country to collaborate with technology developers. By address- ing common R&D gaps for multiple markets, WPTO hopes to create new pathways to market for marine en- ergy technologies and kick-start the reinforcing feedback loop. WPTO's R&D strategy across its entire marine ener- gy portfolio aims to enable technological breakthroughs that reduce the cost and barriers to market for marine energy devices. The knowledge and experience gained from broader blue economy-related markets could po- tentially translate to grid-scale electricity markets. Power Constrained The blue economy is growing; however, power is not readily available in all parts of the world, especially off- "...marine energy is both predictable and reliable, reducing the reliance on large energy storage systems or backup generators that typically accompany other systems. Readily available power at sea could be a key enabler for many sectors and markets within the blue economy..."